People attending the Smoky River Chamber of Commerce “All Candidates Forum,” at Club Alouette in Falher, April 11. An estimated 94 people attended the all candidates forum, sponsored by Smoky River Chamber of Commerce (SRCC) and held at Club Alouette in Falher, April 11. The evening began with an excellent potluck supper, coffee and donuts. 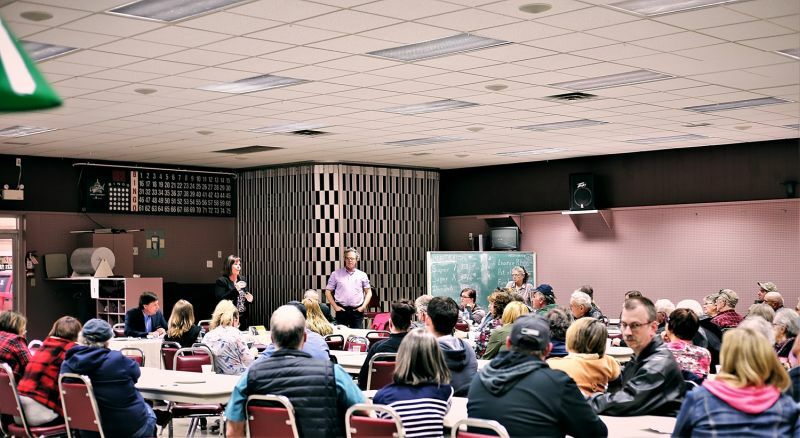 SRCC president, Sandy Primeau, welcomed the candidates and those in attendance, and prior to the forum the three candidates Marg McCuaig-Boyd, NDP – Todd Loewen UCP and Wayne Meyer Alberta Liberal Party, drew lots to decide who would speak first. Todd Loewen drew the long straw so he was first up. He began by cautioning the crowd about a coordinated effort to spread lies about his party. He then moved on to reiterate two of his key election promises: to rescind the carbon tax, and to use equalization payments as leverage against the federal government when fighting to have pipelines built. Loewen talked about fighting to get the economy back on track because every time a community loses a service it makes it difficult to attract new comers or keep the local people in the area. Marg McCuaig-Boyd spoke convincingly about understanding the realities of living in a rural community. She knows firsthand the concerns of rural families and made particular mention of matters related to health care and seniors. Speaking of incentives that would attract people to rural areas, she pointed out that the NDP’s $25-a-day daycare program can help make it possible for young families to live in rural communities. Most importantly, for people living in the Smoky River region, McCuaig-Boyd made an emphatic promise that the McLennan hospital will not close if there is an NDP Government. 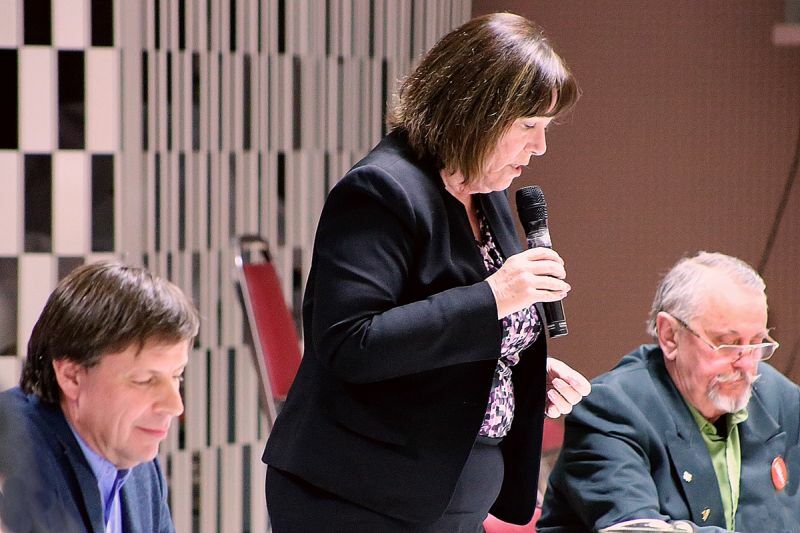 McCuaig-Boyd also expressed her belief that there must be an emphasis on diversifying the economy, to make Alberta less prone to the vagaries of the oil and gas markets. Liberal candidate Wayne Meyer offered brief, but well considered summations and proposed solutions to issues with the same well-calibrated brevity. Being brief and to the point is an extremely rare virtue in politics. As a small businesses owner in a small rural community, Meyer spoke with authority on the added burden the carbon tax imposes on small business, especially in rural communities. However, he also touted the abundant reasons to choose to live in such a community. Meyer is adamantly opposed to the carbon tax because he believes it does not work, but he is also a vocal opponent of selling Alberta’s Crown lands, which he says are a cultural resource that is available to all Albertans for fishing, hiking etc. On the matter of an increase in rural crime, Meyer’s response was typically brief: he sees education and employment as the best solutions to crime. The SRCC all candidates forum was a perfectly organized event from start to finish. Beginning with good food and coffee, the atmosphere was more informal than is usual at such events. Sandy Primeau and Eric Verstappen did a seamless job keeping the debate on schedule and seeing that everyone stayed within the agreed parameters, something they managed to do while still keeping things light. By comparison with the all candidates forum at G.P. Vanier, the candidates seemed more relaxed and all three revealed a little more personality than they did at the previous event. For the undecided voter the SRCC forum delivered more information and all three candidates had moments where they could have swayed those who are undecided. The candidates running in Central Peace-Notley, Todd Loewen, Marg McCuaig-Boyd and Wayne Meyer at the All Candidates Forum.